A Day I have prayed for! We want our boys to be "best of friends" and know that's alot to ask for at this age, considering Samuel can't put his feelings into words! However, God allowed me to get a taste of what is yet to come! Elijah was pushing his empty shopping cart around the house today while I was holding Samuel. I asked Elijah if Samuel could ride and he said, "Sure!" 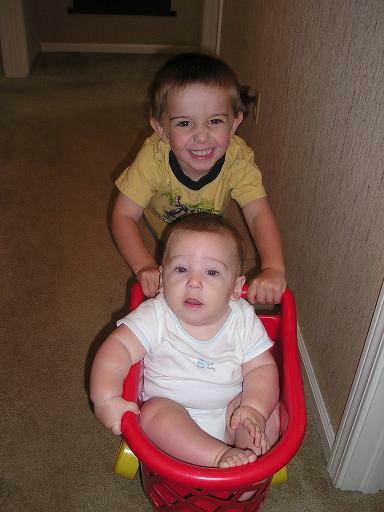 He had fun pushing him around and Samuel loved being 'along for the ride.' And this proud mommy took a picture with the camera, camera phone, and recorded it on video! With Samuel doing more at 6 months old, it's so much fun to watch them interact! I love it! And God is so good!